The road to Applecross, known as Bealach na Bà in Gaelic (the Pass of the Cattle), is a narrow, winding, single-track road in the west Highlands of Scotland. It's quite famous among cyclists, bikers and drivers - and notoriously snowy in winter. It's also not for the faint-hearted. It even has its own Tripadvisor page. As a Highlander in exile, I dream of remote, snowy places but don't get to go there much so of course I turned to Google Streetview to refresh my memory. As it happens, the Streetview car went on this route on a remarkably nice day. So I made a little time-lapse video, which you can see below, in addition to a map of the route. This is the exact same route I used in the video. This road is also part of the route of the north of Scotland's 'North Coast 500' which has recently become really popular among cyclists and other people who love driving rain and extreme pain. But, the scenery is amazing and there are plenty of good places to stop off on the route. 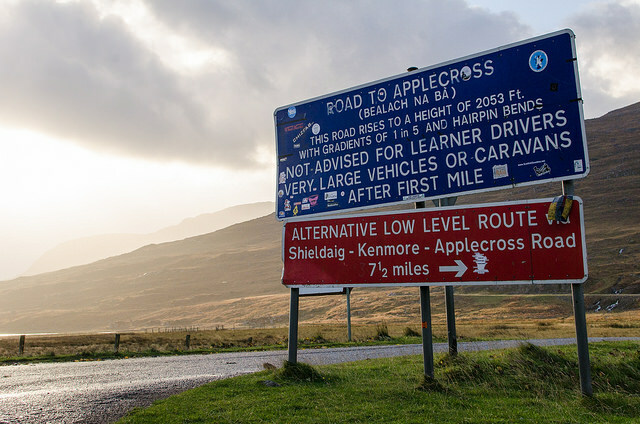 Billed as 'Scotland's answer to Route 66' it also has an incredibly positive Tripadvisor page. This has inadvertently turned into a marketing piece for the Highland Tourist Board when all it was supposed to be was a bit of holiday blogging on a great Highland road, so I'll end here. Further information: I used Brian Folts' brilliant Streetview Player to generate the frames and then just made an mp4 file on my own.